But from executing durable monuments in materials like steel, aluminum, polycarbonate, and acrylic, to outfitting entryways with a company’s prominent logotypes, a national sign company should continually innovate new ways to reinforce your brand’s image and draw attention to its facilities with national branding solutions. According to research, 64 percent of consumers prioritize shared values with a brand over cost, virtually leveling the playing field for both big and small businesses alike as they endeavor to distinguish themselves from competitors. In fact, establishing brand identity allows businesses to highlight excellent customer service, customized solutions, and cost-effective products and services, all of which set the stage for setting prospective client expectations. 45 percent of your brand’s image is what you say and how you say it. 54 percent of people don’t trust brands, so businesses have to earn a prospective client’s trust. 48 percent of consumer loyalty is earned when they make their first purchase or begin service. 80 percent of brand recognition is based on color. Your brand identity is the story you share to convince consumers to engage with your brand. Does your signage do that? Now that you know what brand identity does for promoting your business, you need a national sign company who knows how to tell your story, aligning the authenticity of your brand with innovative sign practices while staying on time and budget. But how do you choose the right signage partner to do just that? A national sign company’s approach to signage solutions includes design, permitting, engineering, project management, fabrication and installation. Additionally, a team of experienced project managers, account managers and installers should coordinate multi-location project rollouts. And – this is especially critical – replicated branding should be consistently executed with precision, location after location. Further, your signage partner should be adept at conceptualizing, creating and implementing signage without deviating from your brand guides, for a flawless aesthetic representative of your established corporate theme across multiple nationwide locations. Additionally, on-site innovative equipment that has the ability to create unique elements authentic to brand standards in an efficient and eco-friendly manner is important for consistency and efficiency. Once you’ve chosen an experienced national sign company, it’s time to execute. Design-build boasts a single expert entity managing the entire process of a custom signage project, resulting in minimized costs, streamlined schedules, and increased efficiency. With design-build, your team works under a single contract with a single point of contact, the design-builder, who is responsible for every aspect of the master plan and build – from estimation, assessments and design, to schematics, permitting and variances, fabrication and installation, taking care of all equipment and project management needs. Creative Sign Designs has been providing high-quality interior, exterior, and digital signage products to satisfied clients, nationwide for 30 years. 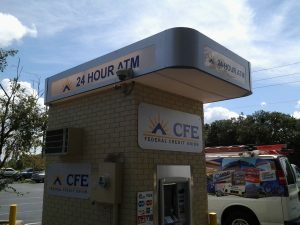 Contact us to let the experienced team at Creative Sign Designs guide you through your national signage project today!